2011 Interim Survey Report There is a more recent evaluation available for this judge. You can access the evaluation here. The Fourth Judicial Commission on Judicial Performance unanimously recommends, by a vote of 8-0, that Judge Lawrence D. Martin BE RETAINED. Larry Martin attended St. Cloud State, MN for two years and completed his undergraduate studies at the University of Minnesota in 1976. He graduated from William Mitchell College of Law in 1982. After law school he worked for the St. Paul City Attorney's Office as an investigator before moving to Colorado Springs in 1983; he was admitted to the Colorado Bar in 1984. He worked in the Colorado Springs legal clinic and was in private practice, specializing in DUI, traffic, and domestic cases. In 1990 he was appointed Magistrate for Division X where his judicial assignments involved domestic and divorce cases. In 1996 he was appointed to the County Bench. 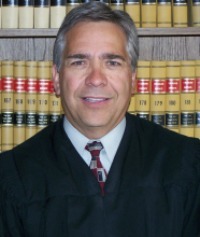 In addition to his regular County Court judge duties, he has twice served as the Presiding County Court Judge for El Paso County. Judge Martin has presided over civil, traffic, and misdemeanor cases. Judge Martin’s community involvement includes coaching the Coronado HS Mock Trial team for 9 years. Judge Martin was mentioned by both groups as being strongly neutral, favoring neither the defense nor the prosecution. His strengths were consistently noted: respect for all parties, diligent efforts to effectively communicate his rulings, affable demeanor, and knowledge of the law. Judge Martin himself identified effective oral communications as an area for growth, and the Commission noted his rapid speaking style and elocution as areas for modest improvement.